A while ago I talked about the art of bootstrapping. It’s not as important as focusing on getting out and getting sales. But it’s still important. Especially for a new startup or a company that’s on shaky ground. There are all sorts of expenses that conspire to erode your cash and profitabilty. Sometimes it’s the small things that add up. Sometimes it’s the big things that seemed like a good idea at the time. Get cheap furniture. 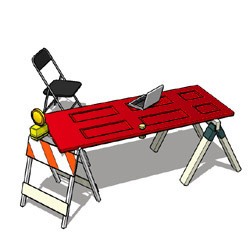 Build a desk out of a door, an old sawhorse, and a street barricade. You can also find funky old furniture from the ’60s, ’70s and ’80s that has a lot of character at garage sales. Lease. Preserve your cash by leasing the equipment, property and other capital assets you need instead of outright buying them. Now you’ve got more cash to put into your sales and marketing effort. Start small. Figure out exactly what you need; how much space, how much equipment. Now divide by 2. Filter it. Scrap the office water cooler service and buy a good water filter for the tap. If your tap-water quality is really nasty, buy a mini reverse osmosis system. Get handy. The more you can do yourself, the more cash you can preserve. Cut down on the services you’re paying for and use extra time and extra bodies to get it done in-house. Blow a bubble. Bubble furniture; it’s cheap, funky. All your visitors in the waiting room are gonna love it! Work the web. Spare the long distance fax and phone charges. Buy a small scanner for digitizing documents and make good use of email, Skype and VoIP. Go open source. There are a lot of great software options for business, and they’re all completely free. Barter. Leverage your network to trade products or services at cost prices. Beg, borrow, and steal. Okay, don’t steal, but utilize your network, friends and family and their expertise to get things done. Make the weather. Lower the thermostat in the winter and hand out company sweatshirts. Raise it up in the summer and make every Friday “Bahama shorts day”. De-light. Replace vast ceiling arrays of fluorescent lights with desk lamps and energy efficient lighting. Pay for mileage. Instead of buying a fleet of company vehicles, utilize your employees’ wheels and pay them a mileage rate. Practice JIT. Just in time purchasing helps your efficiency by utilizing a small space to it’s fullest. It also makes sure you don’t buy things before you need to. Co-brand. Get a sponsor or put a co-branding deal together to cut down the costs of your next big project. It’ll also help get the word out there through the other channels that your partner has. Get some interns. Hiring students in a work experience program is a great option if you have a company full of experienced players. They get great mentorship and you get low cost help. Sub out. Take advantage of your extra space and sub-lease it out to another business or to someone who needs some extra storage. Recycle and reuse. Separate your recyclables to lower your waste charges. Reuse boxes from things you recieved for things you have to ship out. Renegotiate. Pick a lucky supplier and renegotiate your rates or shop around and get a better deal somewhere else. Work at light speed. Put off the time and expense of doing a job, and then blitz to get it done. You’ll be focused like a laser on it and as long as you keep other distrations at bay your efficiency will go up without a loss of quality. Get down. Get a down payment for products or services before you start the job to help cover your purchasing costs of fulfilling the order. Refill. For 20% of the cost of buying a whole new ink cartridge for your printer, you can get it refilled. Go to ground. Shipping is much cheaper if you send it by ground instead of overnight. Stay ahead of the curve and send out your packages a little earlier. Delivery takes longer, but you’ll save a bundle. Find a purchasing partner. Volume buying can save you a ton of money. But you don’t want to buy more than you can comfortably afford or have all that cash sitting there doing nothing. Find another company or a few companies and put together a buying co-op so you can pool your purchasing power together and get a great deal. Screen everything. Rather than printing out documents and using up endless reams of paper, just view them on your computer screen. Create fillable forms in MS Office that you can save and email. And buy a USB hard drive that you can just plug in to back up all your files easily. If it ain’t fixed, broker it. Sometimes you can’t get anywhere near the price you need by negotiating with the big boys because of lack of experience or purchasing volume. Use a good broker or distributor to negotiate for you and get you what you need at a better price. Sell the dust collectors. Things that you aren’t using clutter up your space. Turn that trash into cash and sell them on Ebay or Craig’s List. Check your im-pulse. If you haven’t found the perfect solution at the right price, wait a little. Impulse buying is a great way to spend cash you shouldn’t spend on things that are of little use. Put it off for a day or a week. Do your homework and look around for other options. Upload it. Instead of printing out a ticker-tape parade of brochures, upload a pdf version to your website for people to download. And keep it handy on your computer. When you meet someone, get their email address and send it to them. Put it in the garage. Go big by going home. Forget leasing an office. You’ve got a garage! Mind the china. Using paper plates and plastic cups? Get some real dishes for the office kitchen and roll up your sleeves and wash them when they’re dirty. Shop online. Get a Staples corporate account. Use Amazon. And check out McMaster-Carr. They have everything. Seriously. Everything. Grab the red eye. If you can’t teleconference of set up a video conference then fly in early and catch the red eye flight out. You just saved the cost of a hotel room. Get hostel. If you have to stay overnght, scrap the hotel and stay at a hostel. They’re cheap, and you’re briefcase and power suit will be a big novelty to all the backpackers. And hit ’em up to get creative ideas from all around the world while you’re there. Clip it. Take advantage of coupons, sales, promotions and flyer deals. Be media savvy. You can pay for newspaper, radio and television ads. Or you can develop a network of media contacts and throw a great story about your company at them every once in a while. Do interviews and give them first dibs on your press release. Start small at first and work your way up to getting on Oprah. Ask for freebies. When you’re developing a new project and you need supplies, don’t buy them. Contact the manufacturer or supplier and get some samples. They’re always very accomodating because it’s an investment in getting new business. Pull out the axe. Let’s face it. Whoever’s not cutting it needs to get cut. It’s better for you and honestly, it’s better for them too. Sometimes great people and great positions just don’t fit together. Time it right. Old inventory is usually a good bargain. As the new stuff rolls in, businesses have to get rid of last year’s or last month’s models to make room for the new stuff. Change with the seasons. Every business has its busy season and its off season. Use the off season to ramp down, schedule holidays, and strategize for the next busy season ahead. Cut your fees. Business bank accounts are notorious for charging you fees and paying next to no interest. Go in and get your fees dropped or shop around and find a high interest savings account and a no fee checking account where you can shuffle funds back and forth. This is easy to do if you have a decent balance. Get help. Sometimes an outside perspective or an experienced mentor can see things you can’t and come up with creative cost-cutting solutions. Reward. Hand out a bonus every once in a while when someone comes up with and executes a great cost-cutting idea that saves you a lot of money. Review everything. Go over your financials every single month with a fine tooth comb. Compare your expenses from month to month to see what went up and what didn’t. And why. Make an effort and set goals for implementing some of these cost-cutting ideas every month. Now that you have all this extra cash, push it into your sales and marketing budget. Oh yeah, and pay the rent. Got a great bootstrapping tip? Share it in the comments. Great tips 😀 Did you come up with all of these?? Yeah, I’ve done quite a few of them and know people who have done some of them. They work, and the more you practice them the more they just become automatic. The kind of problem you’re having really comes down to management and “changing the culture”. When it comes to supplying the supplies your team needs, some of them will be very responsible and others will leave stuff around, lose it, take it home and forget it … the more people you have, the bigger a problem it can be. 1. Communicate with your employees and make a list of equipment that each station or person requires. Provide them with a full set of equipment and make sure they understand that it’s theirs and they need to manage it. You want to get your people to start taking ownership of their tasks and responsibility for this stuff. 2. General work supplies should only be accessible by your supervisors. Make it their job to dispense equipment as needed and track who always needs more of what. You need to talk to “problem” people who are always losing their stuff. 3. Make sure that each person knows where they are supposed to store their equipment. When they’re done with something – it has to go back where it came from – immediately. no excuses. That’s very important for keeping a shop organized. It really comes down to building an organizational hierarchy (managers > supervisors > workers), and creating a good culture where people are taking responsibility. And if you’ve got some real bad apples in the bunch who just won’t get with the program … you gotta cut them loose. how to solve the high labour turnover in company? Some companies are structured in a way that make it difficult to keep good employees – maybe because of low wages or less than favorable working conditions. But whether a company is great or less than great, ultimately, employee retention comes down to building a team. It comes down to good leadership. When you have to bootstrap aggressively, and it affects your employees, the key is communication. You have to be up front with them about what you’re doing and why you’re doing it. And if you have strong leadership, you can build an environment where the people there care most about the other people there. They’ll pull together and help you make the changes happen.